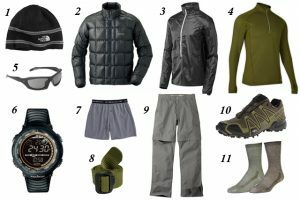 We would like to suggest you to take following clothing and equipment for trekking in Nepal. Warm jacket. Fib refill or down should be adequate. This is especially necessary during winter from December to February. A rainproof jacket with hood or a puncho. Get the one that is guaranteed waterproof. A pair of light weight / heavy weight trousers. Jeans are unsuitable to wear on treks. Cheap loose cotton pants are available in Kathmandu. Heavyweight trousers are useful higher up in the mountains in the morning and at night. Windproof/ waterproof trousers are necessary on all treks going above 10,000 ft. Thermal underwear: These are excellent to sleep in at night. In the winter months thermal underwear are quite invaluable. A tracksuit. Useful for wearing in camp and in the tent. Underwear: normal quantity and swimming costume, hankies. Daypack: This is a small rucksack to carry personal requirement for the day e.g., toilet items, camera, film, towel, soap, a boot etc. Toiletries with large and small towels. Toilet paper can be buy in Kathmandu and some villages in the mountains. Small headlamp and/or torch with spare batteries and bulbs, candles and lighter to burn toilet paper. A lightweight hiking backpack. Here are some of the best hiking backpacks under $100. An umbrella ( optional) which is quite useful to ward of the dogs, suitable as a walking stick, to use as a sunshade and useful when it rains. Reading materials, camera and film, game items (optional), note book, rubber band, pen and pencil, envelopes, a diary, a calendar, a pocket knife, Ibinoculars (optional), a small pillow or headrest (optional). Thermarest (optional) – an inflatable sleeping mat, trekking map, adequate quantities of passport photograph. Please click here if you need further more information.